The Alberni Valley Bulldogs honoured their assistant equipment manager before Wednesday's home game against Nanaimo Clippers. Nov. 9, 2016 12:00 p.m.
It’s five minutes to seven o’clock on game night at Weyerhaeuser Arena, and assistant equipment manager Jamie Amos is in demand in the wings behind the Alberni Valley Bulldogs’ player bench. On this night, Jamie Amos is on the other side of the rink preparing for a special moment: he is working his 1000th junior hockey game in Port Alberni. It is his moment to shine, and even then he is still in demand. Amos has spent 18 seasons in two different arenas in Port Alberni serving two different hockey teams and hundreds of players. He started out with the Port Alberni Bandits of the Junior B Vancouver Island Junior Hockey League (VIJHL), working 144 games with the Bandits before the Junior A Bulldogs came to town. He has worked another 856 games for the ‘Dogs. Amos nervously walks the red carpet to centre ice with Port Alberni Junior Hockey Society president and Bulldogs team governor Ron Paulson. Announcer Charles Mealey begins reciting some of the many statistics Amos has racked up over 18 seasons. 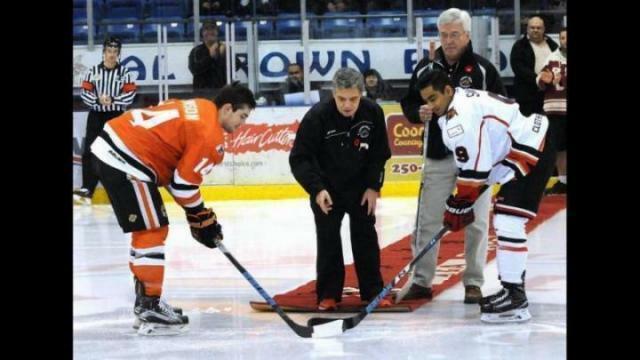 The first team captain he ever worked with was Neil Ward Jr. with the Bandits, and he’s seen several between Ward and present Bulldogs’ captain Jordan Sandhu. “You are the glue that keeps junior hockey together in this city,” Mealey said of Amos. Paulson helps Amos unwrap a plaque commemorating his 1000th game. Nanaimo Clippers team captain Spencer Hewson presented Amos with a signed goalie stick from the team before participating in a ceremonial puck drop with Amos and Sandhu. Amos drops the puck quickly, shakes hands with the players, and waves to the team before turning around and walking back down the red carpet. It’s time for the national anthem, and he has to get back to the dressing room—he’s got work to do.